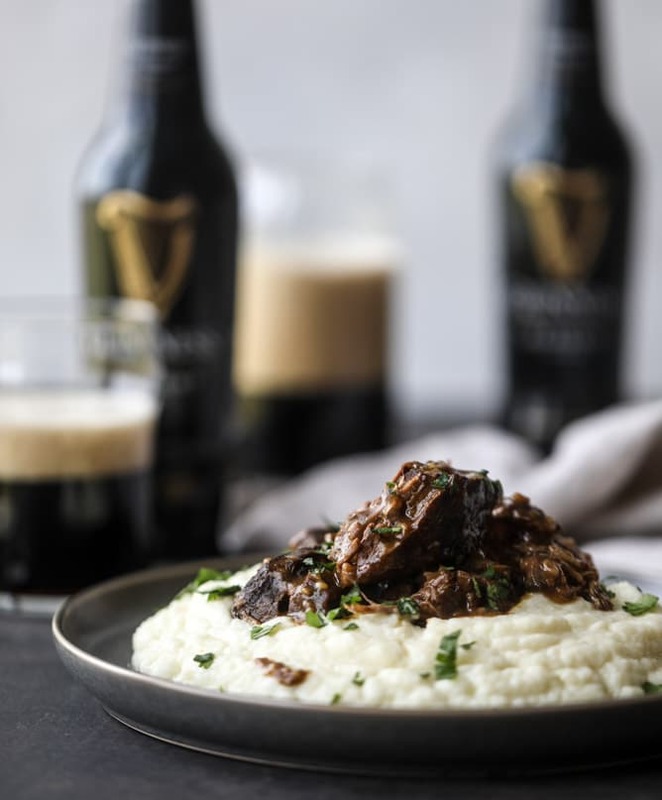 If you’re looking for some major comfort food, these Guinness short ribs and cauliflower mash are the business. I mean, we are talking one heck of a fabulous dinner. These short ribs are SO fantastic. I made these three separate times (and three separate ways) to really test them, and they were also super delicious on sandwiches. And on nachos! Yes yes, omg. Season the short ribs with the salt and pepper. Sprinkle the flour over top and coat them all evenly. At this point, you can throw the short ribs directly in the slow cooker or you can brown them first. I have this slow cooker that sears meat, and it’s amazing! To sear the beef, add the oil to a large pot or dutch oven. Add the ribs and sear on all sides until golden brown, about 1 minute per side. Place the short ribs in the slow cooker and add the Guinness. Cover and cook on low for 8 hours. After 8 hours, remove the short ribs and shred them with kitchen tongs or a fork. At this point, I like to thicken the sauce or liquid that is left in the slow cooker. I use my slow cooker and turn it to the saute setting at 500 degrees. Otherwise, you can transfer the liquid to a saucepan on the stovetop over medium heat. Add the flour to the beef stock in a shaker bottle and shake for 30 seconds to create a slurry. Pour into the saucepan (or slow cooker if you have the same one I do) and whisk constantly until thickened. Cut the head of cauliflower into florets. Place it in a large pot or saucepan and cover it with water, just about an inch past the top of the cauliflower. Bring the mixture to a boil and cook until tender, about 10 minutes or so. Drain the cauliflower, reserving about 1/4 cup of the liquid. Add the cauliflower to a food processor and blend until pureed. Stream in the cooking liquid, the browned butter, the cheddar cheese and the parmesan cheese, along with a pinch of salt and pepper. Blend until creamy. Taste and season additionally if needed! 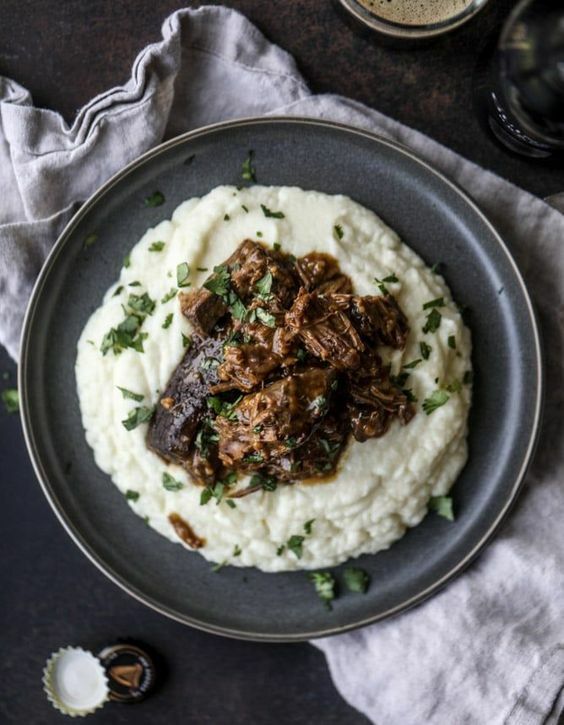 Serve the short ribs with the gravy over the cauliflower mash! 0 Response to "SLOW COOKER GUINNESS SHORT RIBS WITH CHEESY CAULIFLOWER MASH."